With the beginning of Spring comes the thought of weddings. A time of fresh beginnings and love is in the air. Since rustic decor in weddings is becoming increasingly popular, I thought it would be nice to do a feature on some of the best rustic wedding decor that I have found on the Internet. Many of the following ideas can be purchased and some of them might inspire you to get a little creative yourself. Once the wedding date is set and the reception venue is booked, chances are you have a little time to creatively plan out your decor! 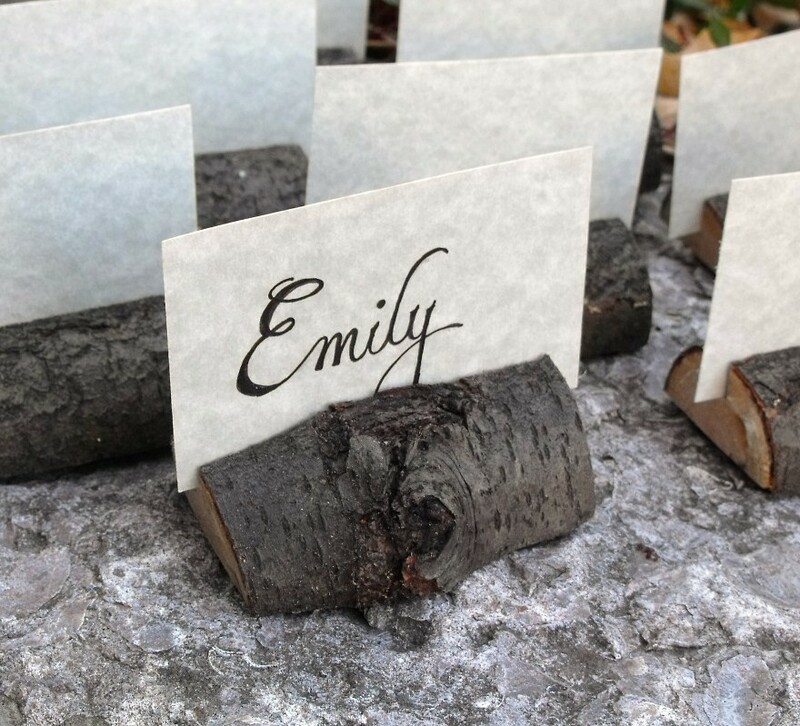 White birch is the most popular element to use in a rustic wedding. When it is paired with white candles, jewel garland or lace, it becomes quite elegant. I absolutely love this table arrangement from www.oncewed.com. The combination of branches, clear jewel garland and the ivory candles makes such an elegantly rustic chic setting for a reception table. Both the bride and groom will enjoy the merging of the natural rustic elements with the elegant and feminine embellishments. 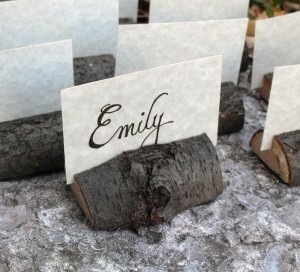 These rustic chic place card holders by Green Wedding are both elegant and simple to make. The calligraphy writing on the parchment paper give the look it’s elegance, dressing up the rustic base. Again, I love combining the two elements, both masculine and feminine. What a perfect pillow for the ring bearer to carry the rings with! 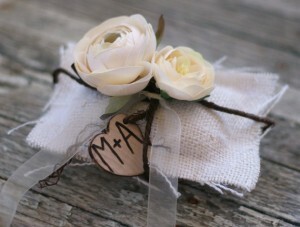 This design from MorgannHillDesigns.com has the right combination of rustic chic. 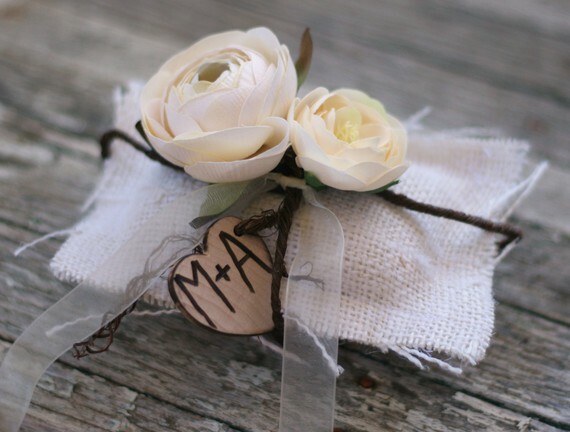 Burlap and lace, roses and twigs – a perfect blend for this style. 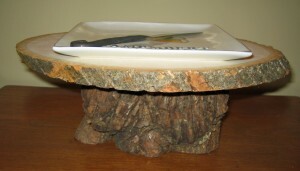 Morgan Hill designs and sells a lot of rustic wedding accents that are very tastefully done. Here is one more example from Morgan Hill that is so exquisite. 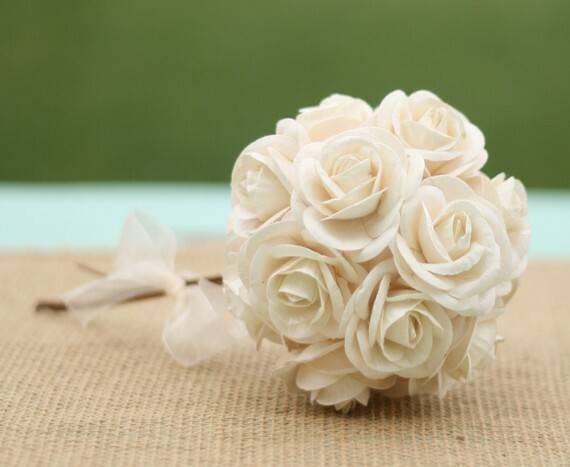 The white paper roses combined with the twigs and lace make it a beautiful bouquet for the bride or bridesmaids. You can’t get much more rustic chic than birch tree posts draped in lace. 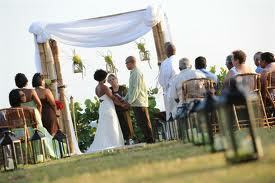 I love this arbor from rockymountaindecor.com for an outdoor wedding. Notice the lanterns at the start of all the chair rows. You could also add some bouquets of flowers in birch vases here. 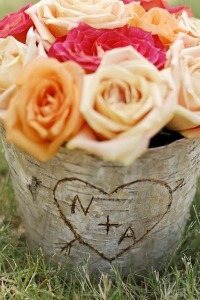 Imagine how pretty these birch vases, by tikkido.com, would look decorating the lawn at an outdoor wedding. I can picture each row of chairs having a vase filled with flowers at the first seat. Some logs cut at various heights and stood on end to act as pillars would look nice in fronts with these arrangements decorating the tops. Fill the vases with colored flowers or go with completely white for a more elegant look. You could also just monogram the vase or vases, with the wood burning pen, in a calligraphy style as well. Glue small clear glass jewel sequins onto birch branches and place several in a clear glass vase. Fill glass bowls with pine cones that have been sprayed with silver glitter spray and add some clear glass marbles. Wrap white peaberry garland around dark pine logs,standing straight up, with white taper candles mixed in. Use pedestal trays like this snack tray I made for condiments. Maybe fill small crystal bowls with mints and place on the tray. You could add a lace doily on top of the tray for added elegance. There is a lot you can do when you just start thinking about combining natural elements with a little bit of glamour. Pick something that you like from nature and then pair it with something that has some sparkle or shine or softness like lace. Love vintage and the great ideas that brides come up with. The arbor is simple but makes a statement and the card holders from wood are very creative.